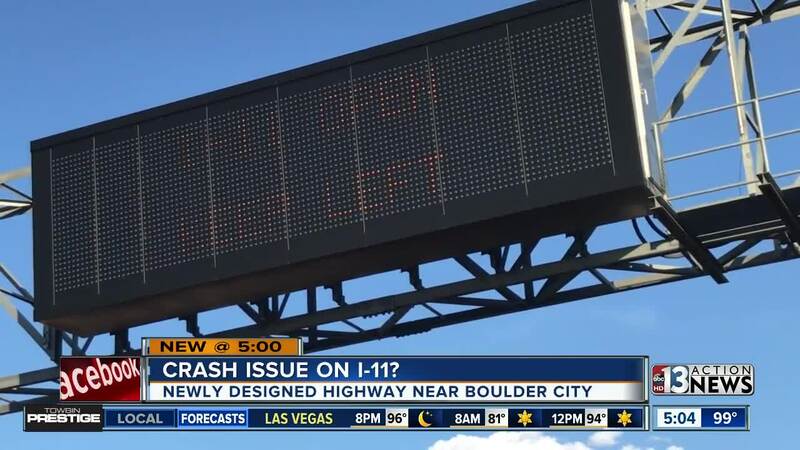 Is the new Interstate 11 dangerous? Concerns over safety are brewing after two deadly crashes along I-11. Austin Carter reports. Concerns are brewing after two fatal crashes that have happened along the newly opened Interstate 11. The fifteen-mile stretch of highway is a faster route between Southern Nevada and Arizona that opened on Aug. 9. There have been two fatal crashes since the opening, which was less than a month ago. Andrew Bennett of the Nevada Department of Public Safety says the problem boils down to driver error. "Impaired driving, seat-belts, speeding, distracted driving, those are all cause of crashes no matter where you are in the state and no matter what roadway,” says Bennett. The first crash happening just five days after I-11 opened to traffic. Both the driver and passenger inside an SUV were killed in the head-on crash. Then Tuesday, two more people were killed when a suspected drunk driver plowed into their parked car on the shoulder. Since day the opening of I-11, Nevada Highway Patrol troopers and Boulder City Police officers have been out along I-11 in full force. "Most of the freeway and interstate are in the city limits of boulder city so we have a concern on our roadways to make sure that they are safe,” says John Glenn, Boulder City Police Department. But even with more enforcement, officials say they are hoping drivers will take the wake up call regarding the new highway. “We absolutely believe in our goal of zero fatalities and we believe it is achievable unfortunately hasn't happened on that roadway,” says Bennett.